When it comes to lawn care costs, much of it has to do with the products and treatments that you decide to use and the routine that you establish for your lawn. Both of these cost factors are entirely up to you, but trimming them down doesn’t mean you are going to have a lawn that is any less substantial or beautiful. As it is, most lawns are over watered and over fed, and both result in the waste of money and resources. The best way to cut lawn costs is to learn about your lawn and grass in general because it gives you a good idea about just what is essential for your lawn and what is overkill. Learning the type of grass you have for a lawn makes a huge difference in the way you care for it. Some grasses are cool season grasses and are not active hot summer month growers, so continuously watering them in an attempt to see some growth happen is a waste of water and time. Other grasses go into dormancy earlier than most and so they begin to die back as soon as fall begins, leaving homeowners on a struggle to feed and water when the grass is going through a natural process of shutting down, so the water and feed is all wasted. If you can’t pinpoint what grass is covering your lawn (or live in a transition zone) but notice patterns when it comes to its growth and setbacks, listen to those cues and change your schedule of watering and feeding. Knowing the type of grass that you have will help keep you from over watering when the grass enters a dormant stage and throughout the growing season. Most lawns do not need watering every day, or even every other day. Grass is actually very resilient and only when you continually water it does it grow dependent on the source. Begin cutting back the watering schedule you are using, pulling out first one, then two waterings per week over the course of the summer. If you are unsure whether browning is caused by drought or dormancy, check the soil, if it is moist and you can poke it with your finger, no water is needed. Of course, in addition to cutting down on your costs by reducing your water bill, conserving water is obviously better for the environment! The height of your lawn plays a huge role in the cost and health of the lawn, so it is something that you need to consider. I have had neighbors complain that their lawn looks bad, but one of the main reasons it does is because they are cutting their lawn too short! You should only ever cut the top third of the grass, go below that and you can stress the grass or even kill it. When grass is stressed it stops growing or starts developing patches, and then you spend more money trying to fix it. The longer you can leave your lawn, the better. Long grass leads to better established roots which in turn leads to the need for less watering. Try to keep your lawn between three and four inches long. Grass will only grow about an inch every ten days (although it may grow faster if you have had a bunch of rain) so that is as frequent as you need to schedule cuttings. The tools you use to care for your lawn cost money, but make sure it is money well spent and that you take good care of your tools. Lawn mower blades need to be sharpened regularly in order to be able to slice through grass with a single attempt. Blades that are not sharp lead to grass that is only half cut or damaged, making lawns appear worse than they did uncut. Do a Google search for “lawn mower repair” and you should be able to find one or several local vendors that can sharpen your blades! Try to avoid cutting your grass first thing in the morning when he lawn is still coated with dew. Cutting a wet (or even damp) lawn is no good for both your lawn AND your lawn mower! 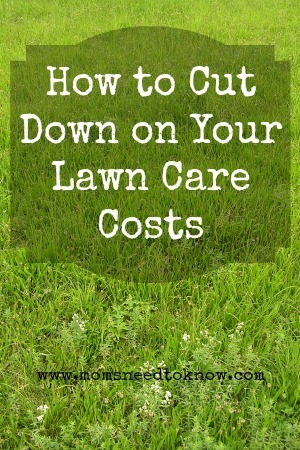 This is one of the most obvious ways to cut your lawn care costs, but I continue to be amazed at how many people don't want to do it! Not to brag too much, but we usually have one of the nicest lawns on our street every year and it is so easy to do. My husband is very good about using the 4 bag Turf Builder systems that are sold at stores like Lowe's and Home Depot. They keep our grass looking fabulous and cost just a fraction of hiring a lawn service.